11 July 2018: On August 1 2018, humanity will have used nature’s resource budget for the entire year, according to Global Footprint Network, an international research organization that has pioneered the Ecological Footprint resource accounting metric. The Ecological Footprint adds up all of people’s competing demands for productive areas, including for food, timber, fibers, carbon sequestration, and accommodation of infrastructure. Currently, carbon emissions make up 60 percent of humanity’s Ecological Footprint. 11 July 2017: By August 2, 2017, we will have used more from nature than our planet can renew in the whole year. We use more ecological resources and services than nature can regenerate through overfishing, overharvesting forests, and emitting more carbon dioxide into the atmosphere than forests can sequester. Currently, carbon emissions make up 60% of humanity’s Ecological Footprint. Consider this: If we cut carbon emissions in half, the date of Earth Overshoot Day would be pushed back by 89 days, or about three months. This is possible, and would reduce humanity’s demand to the ecological resources of 1.2 planets instead of 1.7 as is the case now. 1 August 2016: Earth Overshoot Day 2016 is on August 8 2016. 10 August 2015: Update In less than 8 Months, Humanity exhausts Earth’s budget for the year. 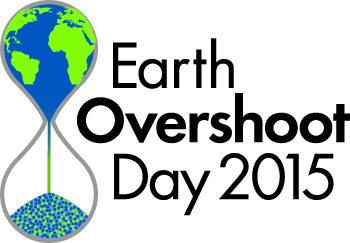 Earth Overshoot Day 2015 lands on August 13. Global overshoot occurs when humanity’s annual demand for the goods and services that our land and seas can provide—fruits and vegetables, meat, fish, wood, cotton for clothing, and carbon dioxide absorption—exceeds what Earth’s ecosystems can renew in a year. Overshoot means we are drawing down the planet’s principal rather than living off its annual interest. This overshoot leads to a depletion of Earth’s life-supporting natural capital and a buildup of carbon dioxide in the atmosphere. 25 August 2014: August 19 is Earth Overshoot Day 2014, marking the date when humanity has exhausted nature’s budget for the year. For the rest of the year, we will maintain our ecological deficit by drawing down local resource stocks and accumulating carbon dioxide in the atmosphere. We will be operating in overshoot. Just as a bank statement tracks income against expenditures, Global Footprint Network measures humanity’s demand for and supply of natural resources and ecological services. And the data is sobering. Global Footprint Network estimates that approximately every eight months, we demand more renewable resources and C02 sequestration than what the planet can provide for an entire year. 25 August 2010: August 21st marks an unfortunate milestone: the day in which we exhaust our ecological budget for the year. Once we pass this day, humanity will have demanded all the ecological services – from filtering CO2 to producing the raw materials for food – that nature can provide this year. From that point until the end of the year, we meet our ecological demand by liquidating resource stocks and accumulating carbon dioxide in the atmosphere. 16 August 2010: Earth Overshoot Day — a concept devised by U.K.-based new economics foundation — marks an unfortunate milestone: the day in which we exhaust our ecological budget for the year. Once we pass Earth Overshoot Day, humanity will have demanded all the ecological services – from filtering CO2 to producing the raw materials for food – that nature can provide this year. From that point until the end of the year, we meet our ecological demand by liquidating resource stocks and accumulating carbon dioxide in the atmosphere. Global Footprint Network calculates nature’s supply in the form of biocapacity, the amount of resources the planet generates each year, and compares that to human demand: the amount it takes to produce all the living resources we consume and absorb our carbon dioxide emissions. Earth Overshoot Day marks the day when demand on ecological services begins to exceed the renewable supply. What is Overshoot? For most of human history, humanity has been able to live off of nature’s interest — consuming resources and producing carbon dioxide at a rate lower than what the planet was able to regenerate and reabsorb each year. But approximately three decades ago, we crossed a critical threshold, and the rate of human demand for ecological services began to outpace the rate at which nature could provide them. This gap between demand and supply — known as ecological overshoot — has grown steadily each year. Global Footprint Network’s most recent data show that it takes one year and five months to generate the ecological services (production of resources and absorption of CO2) that humanity requires in one year. Of course, we only have one Earth. The fact that we are using (or “spending” natural capital) faster than it can replenish is similar to having expenditures that continually exceed income. In planetary terms, the results of our ecological overspending are becoming more clear by the day. Climate change – a result of carbon being emitted faster than it can be reabsorbed by the forests and seas – is the most obvious and arguably pressing result. But there are others as well: shrinking forests, species loss, fisheries collapse and freshwater stress to name a few. Put simply, Earth Overshoot Day shows the day on which our total Ecological Footprint (measured in global hectares) is equal to the biocapacity (also measured in global hectares) that nature can regenerate in that year. For the rest of the year, we are accumulating debt by depleting our natural capital and letting waste accumulate. Tune in on August 1, Earth Overshoot Day, for a #MoveTheDate Live Stream featuring Carter Roberts, President and CEO, World Wildlife Fund, U.S.A. and other guests from around the world. 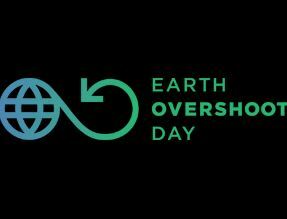 Op 1 augustus is het Earth Overshoot Day! Maar wat is Earth Overshoot Day eigenlijk? En wanneer is de Friese Overshoot Day? Samen met gedeputeerde Schrier gingen we op pad. The video is made available courtesy of the Pachamama Alliance and its Awakening the Dreamer, Changing the Dream Symposium.